Family and Cosmetic Dental Clinic in Nerang. Welcome to Amazing Smiles Gold Coast Dentist. We are an affordable and full service dental practice located in Nerang. In addition we provide an extensive range of services from standard general dentistry to the most complex of cosmetic dentistry cases. Most noteworthy, our experienced team create customized treatment plans for kids through to seniors. Above all our doors are always open to new patients. Furthermore we accommodate individuals that may feel anxious to visit a dentist. Due to this, we look forward in welcoming you to a caring and compassionate environment. Even more with state of the art digital technologies and modern equipment, Amazing Smiles are dedicated in restoring smiles and preserving good oral health. Are you looking for an after hours dentist? Emergency after hours dentistry are by appointment only therefore please call 0411 389 826. In contrast standard bookings and questions please phone our front desk on (07) 5596 3299 or email nerang@amazingsmiles.com.au. Free initial consult for quotes on cosmetic dental or orthodontic services. Your teeth and gums are with you for life! Therefore make good oral health a priority to help preserve your natural teeth. A vibrant smile and pain free teeth can change the outlook of your day. We are your local Gold Coast Dentists in keeping your teeth and gums healthy. Our dental clinics are comprised of experienced and Australian Dental Registered practitioners to assist specifically to your needs. As a result each patient is individually catered for. This ensures that treatments and prices are tailored for you. Easy Highway Access off the M1 on Nerang-Broadbeach Rd. Founded on the Gold Coast by cosmetic dentist Dr. David Mai over 15 years ago, Amazing Smiles has grown to 5 major clinics across South East Queensland. Renowned on the Gold Coast, each dentist takes the responsibility of ensuring compassion, respect and excellence. Our goal is providing each patient with an inspiring and personalized approach. Furthermore, the most rewarding aspect of our work are the relationships we build with clientele and the life-changing smiles that we’re able to make. Our individualized and personalized approach provides outstanding results. Comprising of experienced dentists that are diversely skilled in resolving complex of cases, each patient receives comprehensive care. Our dentists can assist you with; orthodontic (dental braces), braces for kids, crowns and bridges, veneers, prosthetist, endodontist, periodontology, also through to standard dental treatments. With your initial point of contact and detailing your concerns, our team will recommend the most appropriate dentist for your your needs. As a result from accommodating intricate cases, we continuously draw upon the latest in trends and technologies. Hence our dentists and dental technicians are continuously trained and educated for complete care and professional advice. Given these points, our dentists can design smile makeover packages to rejuvenate and create confident smiles for you. Most noteworthy using the latest in digital technologies, our aim is to be a one-stop clinic for all dentistry needs. As a result, we minimize any external specialist trips to other centers. Furthermore, our belief is that everyone deserves excellent oral health. Therefore, we provide affordable quality dental along with dental payment plans with ZipMoney and Denticare. First time visitors are recommended to arrive 5-10 minutes before appointment times. Above all please inform us of any concerns that you may have. Upon arrival you will be asked to complete a standard patient confidentiality and consent form. Furthermore advise our admin of any referrals that you may have been appointed from. Once more please don’t hesitate for any financial queries. To conclude our team can assist with advice regarding Private Health Options, Medicare (Bulk Billing) or Payment Plan uncertainties. Our team have been well advised on all options that may be suit the patient. Finally do you have a quesiton for our Nerang Dental Clinic? 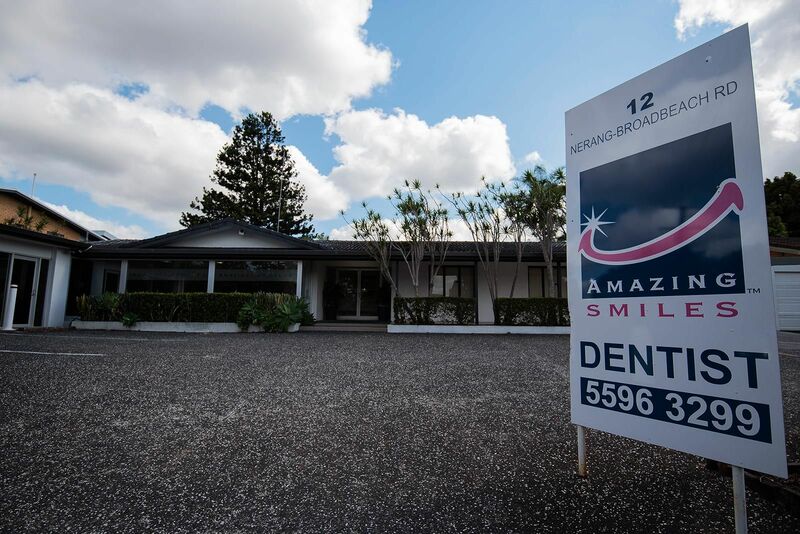 Ask our experienced team today (07) 5596 3299 or email nerang@amazingsmiles.com.au. We offer Free initial consultations for quotes. For 24/7 Emergency Gold Coast Dentist appointments call us on 0411 389 826. Phone call’s are essential for Gold Coast after hour dental appointments. Take exit 71 (Nerang-Broadbeach Rd) off the M1.